As a conclusion to 2013 we like to look back over all the weddings that we covered and choose the top 10 images from 2013. Of course not to take away from any of the weddings that haven't featured or indeed the thousands of other images which can be found through our other blog posts and gallery. It was an incredibly difficult decision however in ascending order here are our favourite images from 2013. There are many images in our portfolio that nicely capture the moment but this image encapsulates 'capturing the moment' perfectly. One on side we have the two girls laughing and playing with delight and on the other side a young gentlemen gleefully enjoying his own little moment. I am sure this image will end up haunting him for many years and may even hopefully feature and an embarrasing image at his own wedding. 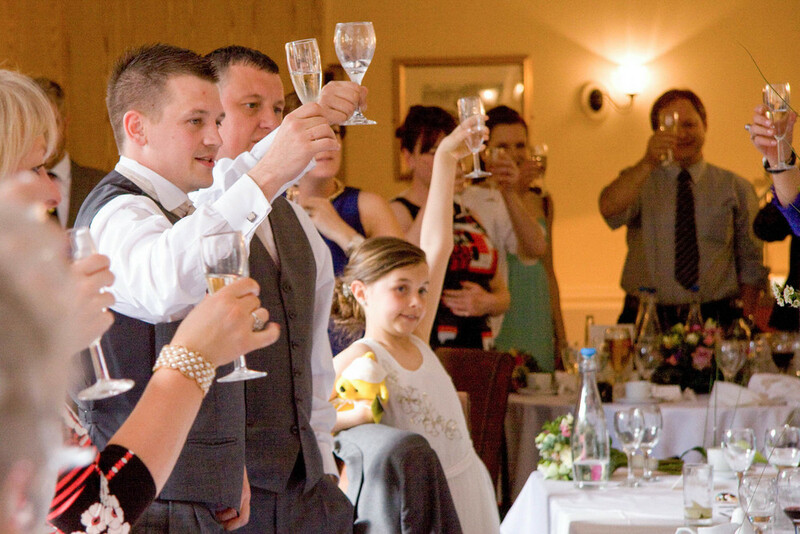 Featuring the same lovely little lady at 10, this time we see her involved in the adult celebrations enthusiastically raising a glass to the bride and groom. Oh and I checked, she didn't actually have any champers in there. A short excursion away after the wedding ceremony found us visit this beautiful site overlooking the peak district village of Hathersage. The best part is that this outcropping is right next to the road and this little setting provoked several 'honks' of approval from passing commuters. Great fun! Based on an image I originally shot for the cover of a music magazine a few years ago the groom and his groomsmen all started in a line before sprinting to win the drink. There may have been a slight false start from the groom but I'm sure the guys forgave him. Placing the bride here just by the window provided some beautiful soft lighting, perfectly balanced to complement her elegant and calm nature even right before the moment the couple had been building up to for months. I love this shot. Though I wouldn't dare to assume to know what this lovely flowergirl was thinking, I like to believe that this is a look of admiration. The bride, asked her to hold the bouquet while she fixed her veil and we caught this moment just as the flowergirl looked on with clearly a deep thought in her mind. Could she be admiring how beautiful her aunt looks or perhaps imaging her own future date. On the wedding day, posing for photos all day may find you eventually tiring of smiling for the camera but we never struggle to spark a genuine smile when the newlyweds share a little kiss. This has already become a very popular image with prospective clients. This little chap spent 99% of the day running round at a million mile an hour but this short moment showed a different contemplative side of him that is quite moving. 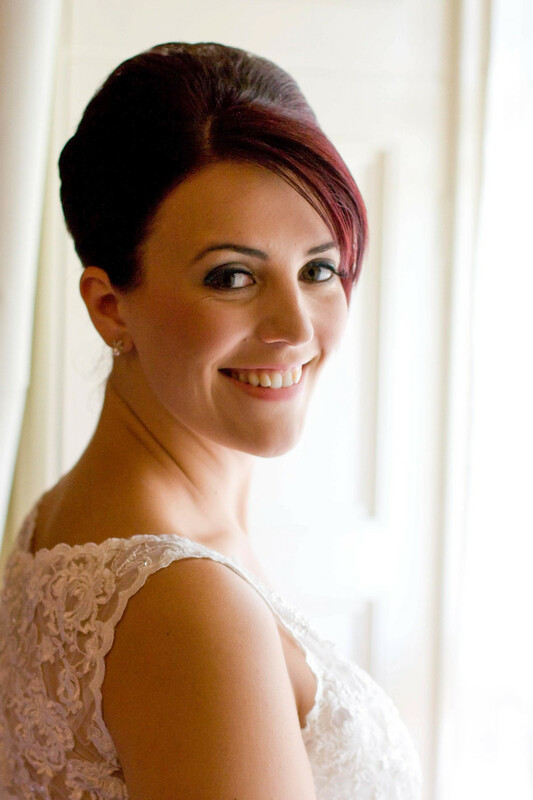 This bride had such an emotive and rye smile which was equally expressed through her eyes and entire face. I think this image captures that perfectly and offset against the beautiful backdrop of their wedding venue, this is truly one of my favourite from 2013. Now, of course, it was always going to be a tough fought thing to choose our single favourite image from 2013 but both Alice and I agreed this simply had to be No.1. Its truly moving to see the raw emotion when couples exchange their vows, to promise themselves to one another and begin their journey in a new life together in their own new little family unit. It is this sort of beautiful moment that reaffirms our enjoyment of weddings and ignites our passion for photography. It warms my heart everytime I see this image and pick out the single tear rolling down the brides cheek as she vows to share the rest of her life with this lucky man. Most definitely a poignant moment and deserving of our top spot for 2013.